I had a bit of a problem. A mug problem that is. 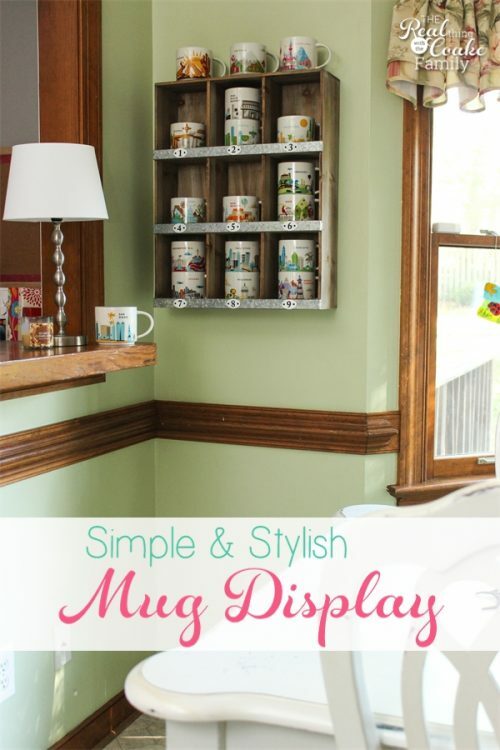 I figured out what I think is a cute and stylish storage solution and I thought you might like seeing it since a lot of you have commented on and enjoyed my mug collection both here on the blog as well as on Instagram. The problem with them is that I know have quite the collection. Our trip last summer was 13 states and 5,400 miles. Our trip this summer was 21 states and 7,000 miles. Yep, I've got mugs coming out of my ears. I contemplated building a pretty display shelf, but I don't really have the time or energy for that right now. Do you know what I mean? I was searching for something simple while at Target a few weeks ago and it hit me… I could try one of these shelves (affiliate link) that I love. I have one in my office. It holds baker's twine, glitter, buttons, washi tape, and small photography props. You may have seen it in the background if you have been on a scope on Periscope with me. My whole You Are Here mug collection from our 2014 and 2015 road trips along with some other travel. Fun! I went home and tried it first. To make sure the mugs would actually fit. I currently have 26 mugs. Originally, I thought I would buy two of the shelves and paint them and re-number them. All great plans, but once again I lack the time right now and I like the look of the shelf as it is. It totally doesn't match my outdated kitchen…which is not good for a serial DIY'er. Lol! Anyway, when I went to buy them, I decided to only buy 1 shelf. I just didn't want to spend $120 on the display for my mugs. $60 already felt like a stretch to me. I also have very little wall space in my kitchen and they would have had to stack one on top of the other. I thought it would end up too crowded and take away from some of the fun of the display. I can, of course, rotate them out as well. It is so nice to have my kitchen counter back! I had half of the mugs in my cabinet and the other, the new mugs from this summer, out on my counter. I'm a clean, clutter free counter kind of a person. I'm glad to have them out of the way yet fully on display. While I'm confessing that I have favorites, I thought I could show you a few of my favorites. Since I grew up in Arizona and miss the lack of humidity that my home state has to offer, it has to be a favorite. 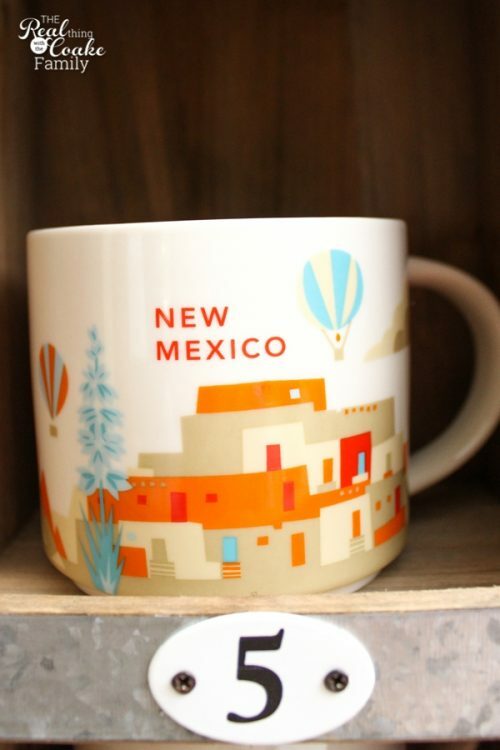 We also really loved New Mexico and I love the colors of this mug. Fun and pretty! We didn't really like Ohio (sorry Ohioans), but I love the colors of the mug. 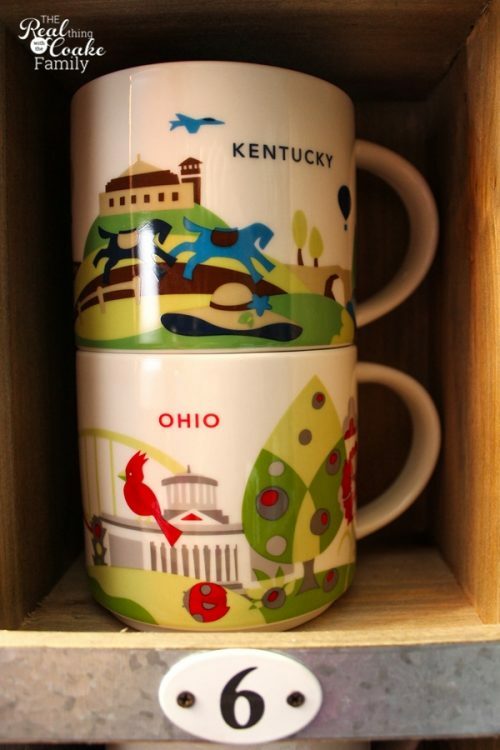 I also just love the Kentucky mug. Love the horses and the colors. 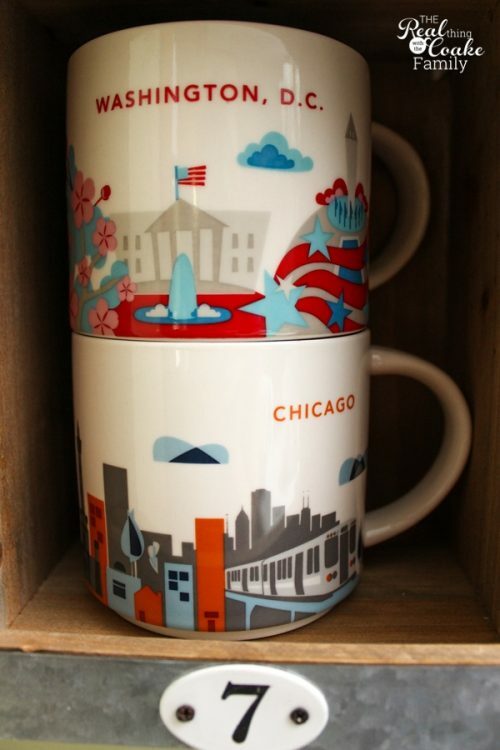 The D.C. mug with the Cherry Blossoms and fun colors is always a favorite. Chicago is another that I love for the memories. Back to my hometown…love the Gila monster. I miss my hometown, but the heat…not so much. Of course, I would take the dry heat any day over the humid heat where we currently live. 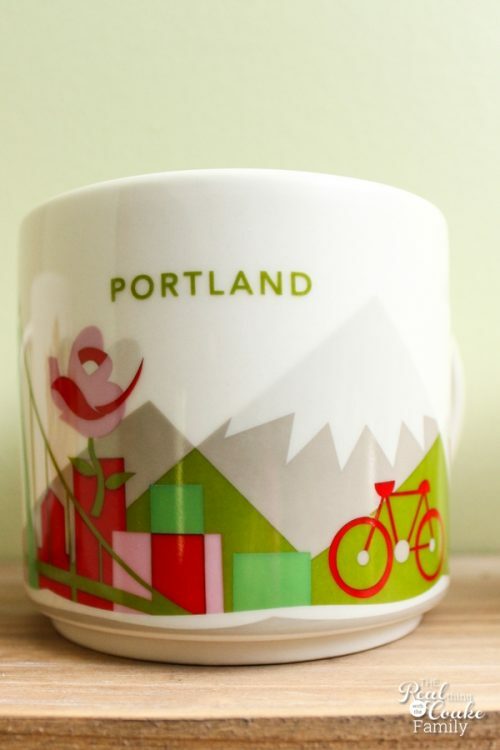 Portland still has my heart and I think my be home to me forever…even though I don't live there…for now. 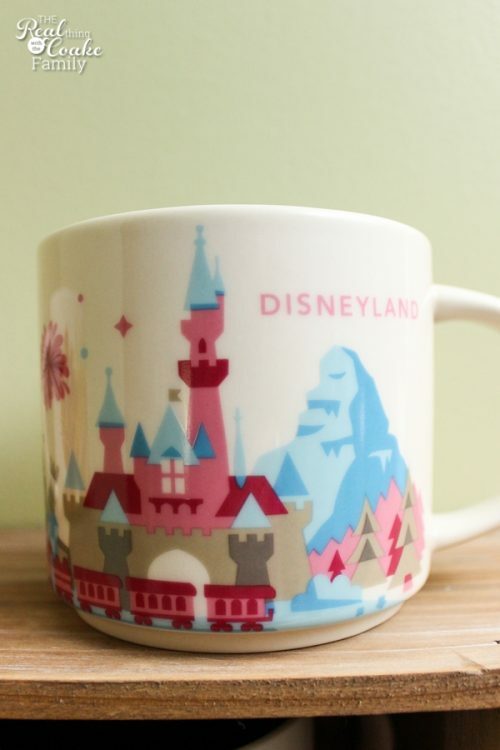 I am so glad I was able to get this mug and it is one of my top favorites for that reason. Hello, Disneyland pink and blue cuteness! Just such a cute mug. Another top favorite. There you have it. 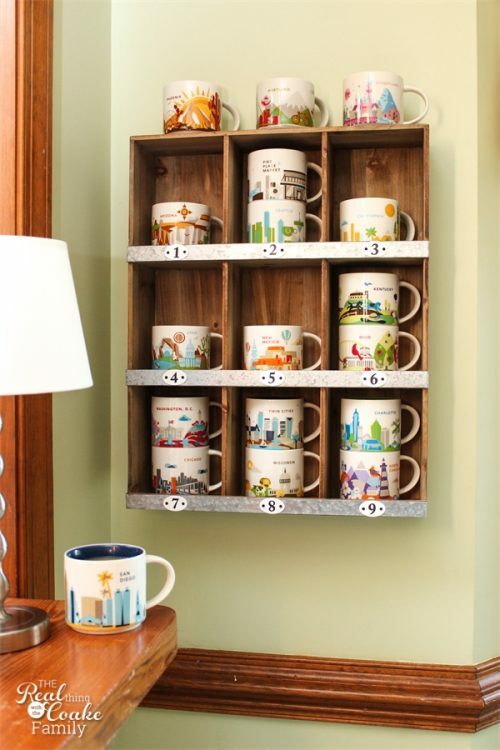 There are tons of ideas on Pinterest for mug storage. This is just one idea. 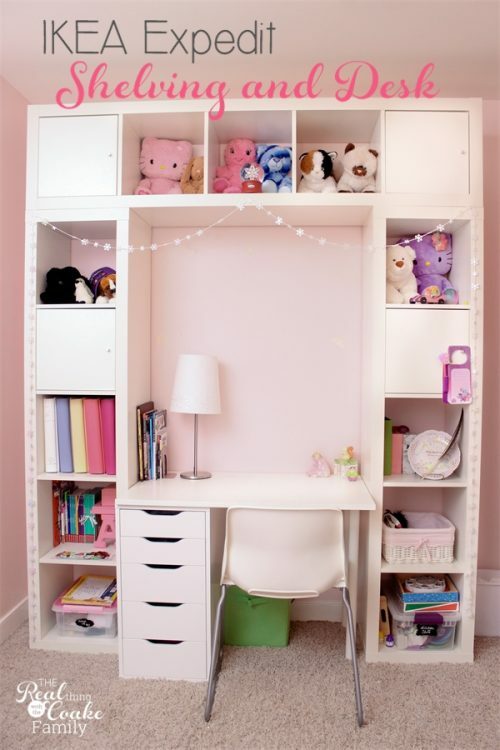 It is a great idea for those who need something ready made and have limited wall space. It also allows you to play favorites…lol! Thankfully, this was an easy project and provided a great solution for my growing mug collection. Wonder what mugs I will add this year and next summer? Can't wait to find out! 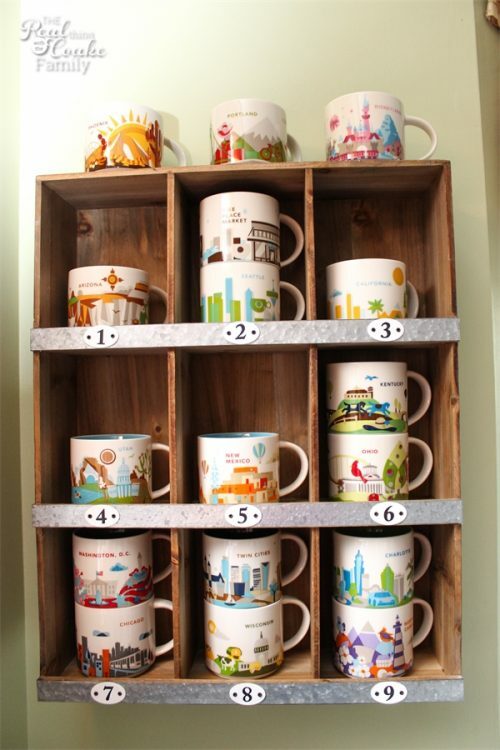 Do you have a mug collection? 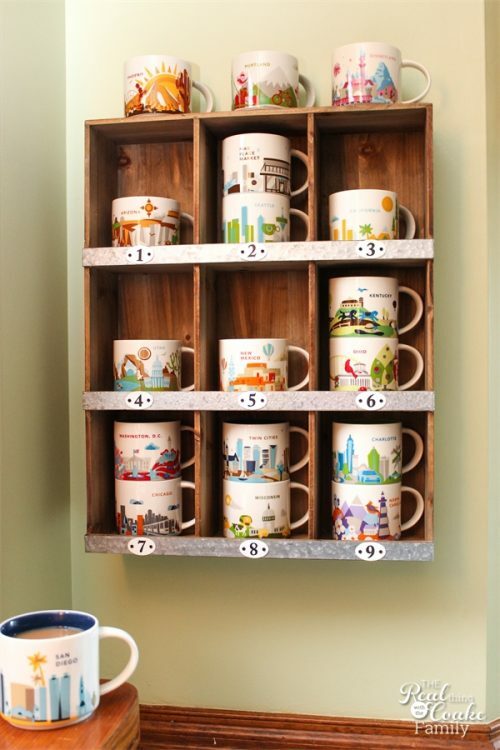 How do you store your mugs? Leave me a comment below. I love all of your mugs. I had no idea the Starbucks had these. If we get down south again I will have to start my own collection. 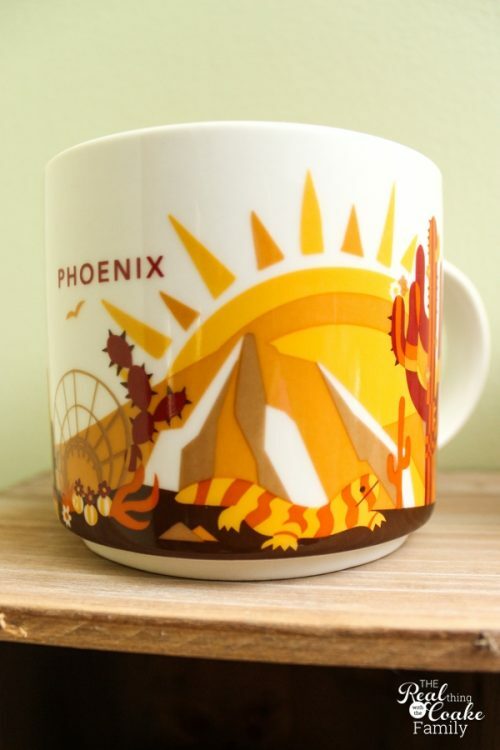 I haven’t seen the mugs in Canada, but they would be nice to have. The display case is great, the mugs are worth showing off. I see you already replied, but they do have mugs from Canada. you can start your own collection and add to it as you travel. Have fun! It did come from Target. I’m not sure what the name of it is. I don’t know how you live without Target, though I’m sure you have something equally as fab. Do you know why Target left Canada? I had no idea. Lots of ideas but I don’t know the facts. The most obvious issue for me was Target’s inability to have products on the shelf…the shelves were often half empty. Not what I expected when I went shopping there. Did you get one from WV? There’s a Starbucks not far from the pink elephant you photographed, but I don’t know if they have the mugs. There isn’t currently a mug for WV. Unfortunately, they don’t have them for all states. 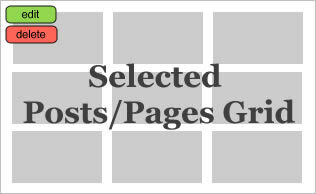 I wish they had more, but they must select based on how many they think they will sell for that area. I spoke too soon. We do have the mugs! I went to Starbucks today and saw them. I am very excited. I also think they would make perfect gifts for friends who move away. Yay! Glad you found them. I agree, they would make great gifts for friends who moved away or gifts for relatives out of town. Put a mug in a box with some delish coffee and maybe a mix to make a breakfast goodie. Yum! I have a big fetish for cat mugs. well actually anything “catty”. I’m not even sure how many I have but must at least be 30 or more. Sounds like a big collection and cuteness! How do you store them? love your mugs and the way you have displayed them. 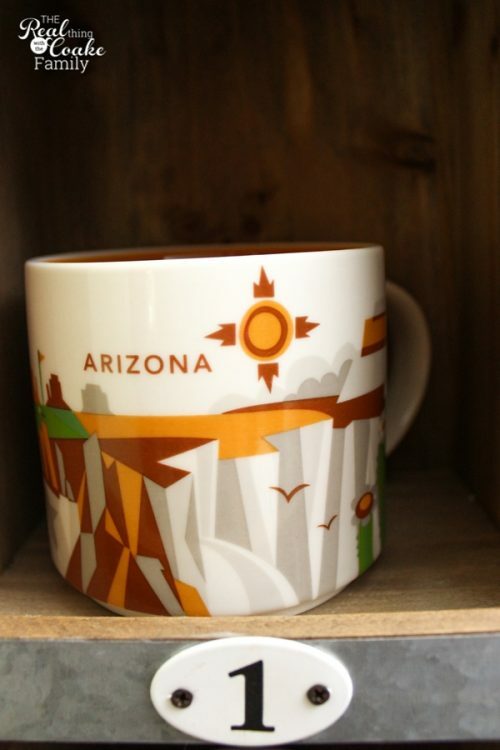 I saw a mug one in Colorado and wanted to get it for you. 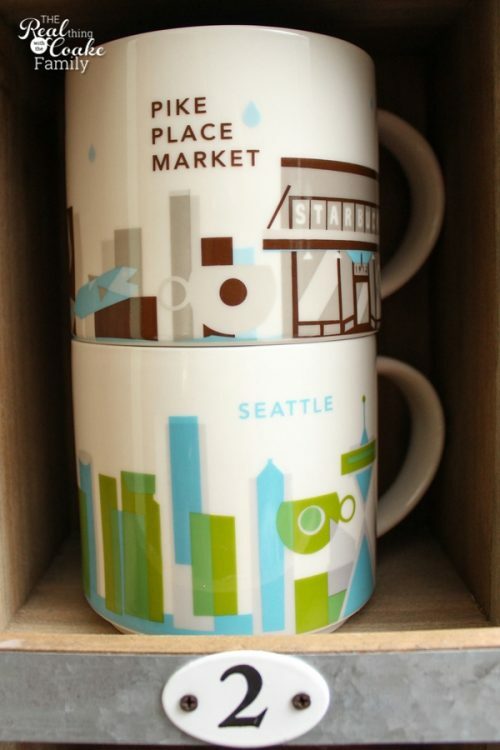 Sorry I could not find out if you wanted mugs from states you had been to before in your life. Love to know if you get this comment. Trying to find a way to be able to comment.